NOTE >>> Many of the images in this thread will have broken links due to my selling of the accrete.com domain in May 2018. 1) I'm just a regular guy...my day job has nothing to do with RV repair or maintenance so anything you see or read in this build thread posted by myself is from a non-professional POV. 2) Please always follow common sense and manufacturer's suggestions. 3) Please leave comments and suggestions! > > First up i'll mention the 2010 Chevy AWD van that began as a stock cargo van and was built into a Aluminess trail bling Boulder Off Road lift adventure van. I want to thank the gang at the SMB, ExpeditionPortal, & Wander The West forums for all the posts on their projects that have given my wife and i ideas and direction through all the many hours of reading (actually since about 2008?). 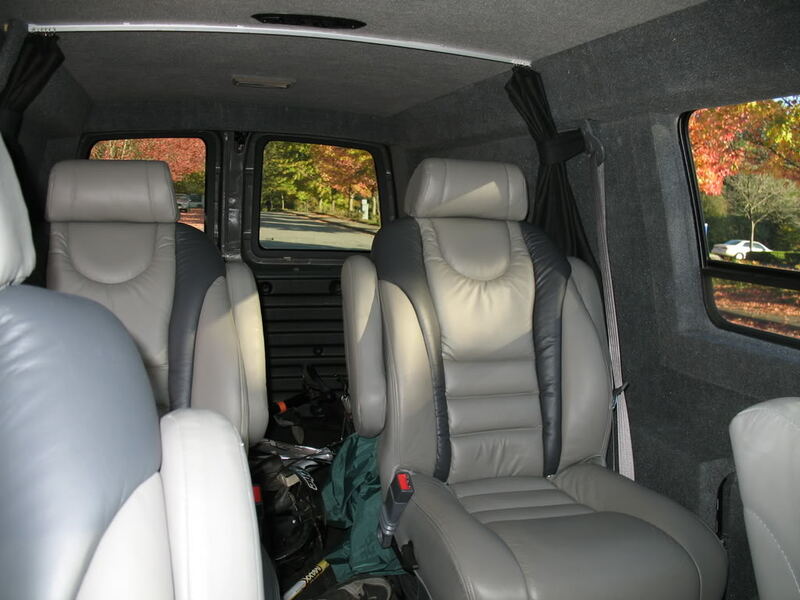 We began with a 2010 stock cargo Chevy Express AWD Van purchased new in late October 2010. We wanted AWD for our wet roads on the Oregon Coast, and also knew we did not need 4x4 capability for the trails and camps we visit. Over 30 years of off roading in various rigs we found ourselves _needing_ 4x4 only to _play_. For daily driving we had grown fond of the AWD setup in Mitsubishi and Volvo, and with a local friend with the same Chevy AWD we believed it would be a winner for us. Shown with 24" Fiberine fiberglass top, Fiamma F45 Awning installed by Van Specialties in Portland Oregon. My wife & I applied the 3m Di-noc vinyl wrap on hood & emblem...we really should have asked for help on that one! LED Truck-Lite head lights ROCK!!! A friend helped install the Boulder Off Road 2" lift (actually ~2.5"~). PS update: Spring of 2018: The rig continues to amaze us in its _ability_ and comfort + convenience. To be able to take spontaneous trips to where ever knowing the van has full provisions and capability for a comfortable week away from home and power is wonderful. Rig is now just past 7 years old and has ~47K miles on the it and we enjoy it more each trip. And of course the wife luvs it for her Daily Driver! As always, your constructive critique and thoughts are appreciated ! Below are some pictures of stock van in our backyard on the Oregon Coast. Took delivery in late October of a stock cargo 2010 Chevy Express AWD Van. This one (one of two i was able to locate at year end on the west coast) has the locking rear differential that we were looking for. No bells and whistles other than locking doors and stock AM/FM radio. Haven't had roll up windows in forever, but it's only the two in the cab so no biggie. GM had several year end offers at the time. They were offering a $1K rebate if you had at least that much in "Commercial Upfit" so we had van specialties put on the top and awning. When the papers were signed the rig came in at ~$27K, well under our _Van_ budget for the project. Also, within the first week we had the van we had our local Les Schwab install a set of Wild Country XTX traction tires. It ought to be illegal to sell vehicles with the throw away tires most have upon delivery! Within three weeks we had snow and ice on the roads and were glad we had the new shoes on the van. The van at-scales weighed 5300 lbs with full tank. Once the top/awning were on it was up to 5500. The GVWR is 7300 so i figure we have about 800 to 900lbs build-target and still have good wiggle room. We are going to build in the WESTY fashion and go as light/simple as possible with our home-build skill-set. This is my second Van-build, and third RV interior build/mod. My wife is a master McGirlver and comes up with some really out-of-the-box ideas. She is also good on the sewing machine and will be doing the headling, fabric trims, seat cover mods, etc. Since this would be a daily driver and we wanted to have a rig that allowed more spontaneity than our previous set up (Tacoma + Off-Road-Capable Trailer) we knew we wanted a few things. One was full-time standing head room without a pop up. Our trailer was an Aliner EASE with pop up solid aluminum sides. While it kept the weather out, it turned out to be a hinderence to our style. The fit/finish is high quality marine grade exterior gell coat. The interior we ordered stock/rough-finish as we will complete the interior ourselves. Right now we are still experiencing the smell of silicone due to cold days and unable to let the rig really air out much. The reverse flange is very nice. There are no exterior attachments. All bolts are inside and we are very pleased with the outside look. Look forward to following your progress. Especially the possible "McGirlver" ideas. I have no such counterpart on my own build team. Hi Dave and thank you for the warm welcome. We spent some time at Mill End Fabrics in Portland looking for some complementary fabric for the center line of the seat covers. She wanted to have ultraswade and quilt-backing in the area of contact/seating. They are coming along nicely and i'll upload the finished product when in the rig. The seat backs are set up so you can attach the supplied pouches/packs in any configuation that suits your needs. There are enough places for just about all our individual personal needs all in an easily organized fashion. My previous van was a GMC 2wd. Great van, enjoy yours! IMO I would continue to work with Van Specialties. The are finishing up on my current Ford.